With the Royals just a few days away from kicking off this 2018 campaign, I thought it would be good to throw out some predictions. But not the normal sort of predictions. No, I traveled down a different road. So here are your 2018 Royals fake predictions. I’ve done these in the past and they were wildly popular. These are all jokes, so please don’t take any of this too seriously. They are just meant as amusement as we get ready to kick off the new season. So without further ado, here are your ‘Fake Royals Predictions’! After a near-death experience in the offseason, manager Ned Yost has grown a greater appreciation for the men and women of the media that he interacts with on a regular basis. Rather than snarky sound bites and short, abrupt answers, Ned gives the media answers with heartfelt, thought provoking feeling and life affirming positivity. Then they have a group hug when the session is over. On Opening Day, Lucas Duda will make his official Royals debut…and will be awarded a 2015 World Championship ring. With Lorenzo Cain off to Milwaukee, Salvador Perez is in need of a new best friend that he can harass and shoot instagram videos of. Luckily, that honor has been bestowed onto Jon Jay. Unbeknownst to Jay, he agreed to it when he signed his contract, as it was slipped in there thanks to some sneaky maneuvering by Salvy. Alex Gordon’s offensive struggles continue as the season begins, forcing him to try everything in the book to get out of this two-year funk. Gordon even resorts to eating junk food, which actually does improve his production…at first. After appearing in all 162 games for three of the last four seasons, Alcides Escobar goes to Ned Yost 25 games into the season and asks for a day off because he is tired. Escobar falls asleep and awakens the last week of September, missing almost the entire season. After giving up a dozen home runs, Ian Kennedy finally decides to become a different pitcher, one who focuses on ground balls. He then goes from giving up long bombs to inside the park home runs, still leading the league in home runs allowed. A number of Royals fans attempt to play ‘Rex Bingo’ (a game my family created last year) during a lazy May afternoon game but everyone hits bingo by the second inning. All the mentions of ‘hands’ and ‘sneaking cheese by a hungry rat’ seems to have caused their boards to fill up super fast. Jason Hammel asks to be moved to the bullpen and puts up good numbers through the first half. Come to find out after the All-Star break that Hammel and Luke Hochevar had a ‘Parent Trap’ moment and it was Luke all along these last two seasons. In Whit Merrifield’s never-ending quest to ‘beef up’, he increases his protein intake and starts adding even more muscle mass to his frame. Whit sees a spike in his home runs yet again, but on the diamond he becomes a defensive liability. Think Daniel Murphy crossed with Alberto Callaspo at second base. Steve Physioc realizes that the notes he is given before each game are to be used to help him during the broadcast. Not only does he start sounding like a competent announcer, he also receives less glares from Denny Matthews. The Royals swap out one debonair first base coach for another, as Mitch Maier takes over for Rusty Kuntz. While many will miss Rusty, it doesn’t take long for the fans to warm up to the former Royals outfielder. A petition is started and Maier will get his own bobblehead night in 2019. While trying to forget a rough 2017, Kelvin Herrera decides to add an eephus pitch to his repertoire. Herrera finds success again, but it kills the Royals time of game. The pace of play Gods are angered. Richard Lovelady tires of all the talk of his name and little discussion on his actual statistics. This leads him to change his name to something very bland and vanilla. You can now legally call him ‘Tim Collins’. As the Royals attempt to stay as ‘pure’ as humanly possible, they start attending workshops over the summer discussing the ill effects of watching cartoon animals who don’t wear pants. 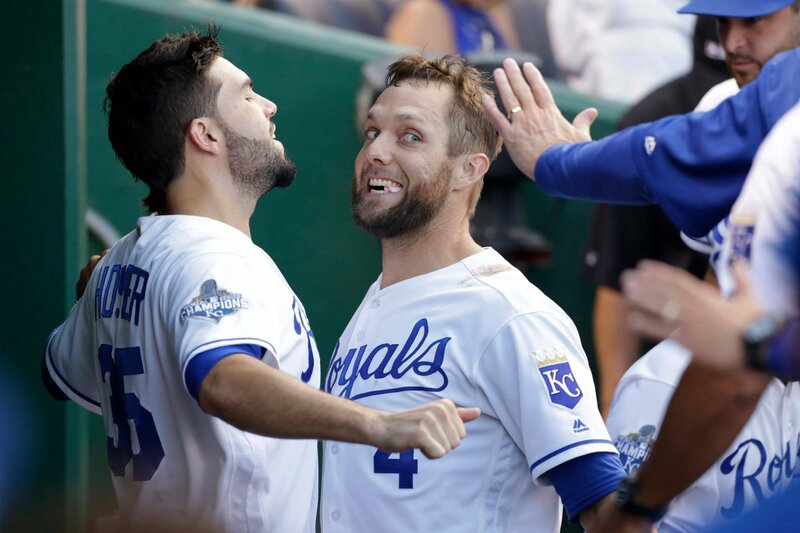 Mike Moustakas was only able to land a $6.5 million deal this winter to return to Kansas City. The cut in pay has made it harder on Moose, as he no longer can afford his Stouffer Fit Kitchen Meals. Brian Flynn will not fall through a barn…at least not for the first month of the season. All bets off after that. Jorge Soler will hit the ball so hard this year that he will actually knock the cover off the ball. Also, Soler will swing and miss so hard that he will knock the cover off the ball. and finally, the Royals will replace hitting coach Terry Bradshaw in May as the offense struggles. He will be replaced with former Pittsburgh Steelers quarterback Terry Bradshaw. Somehow, the offense will become the best in the league. So there you go, my 2018 fake Royals predictions. Hopefully you took them as they meant to be, which is all in jest. I will seriously crack up laughing if even one of these come true. I’m sure there is one or two I missed. So what fake predictions do you have for the upcoming season? What would amuse you if it happened to the Royals in 2018? Is Jake Junis For Real?